On Friday afternoon, Brooklyn Bridge Park will officially open a roller rink at Pier 2, a new five-acre recreation area with fitness equipment, shuffleboard and basketball courts that opened in mid-May. And on Friday night, Prospect Park’s new rink plans to host the first of its weekly roller skating parties run by Lola Star, whose popular Dreamland Roller Rink closed in Coney Island in 2010. The first party is “Flashdance” themed, complete with a red carpet and circus performers. With a third rink, this one at Riverbank State Park in Hamilton Heights, also being renovated, New Yorkers who still love going for an old-school spin are wondering if the pastime—which calls to mind preteen birthday parties and 80s icons, such as Olivia Newton-John in the film “Xanadu” or Cher with her roller-themed “Hell on Wheels” video—is making a resurgence in the city. 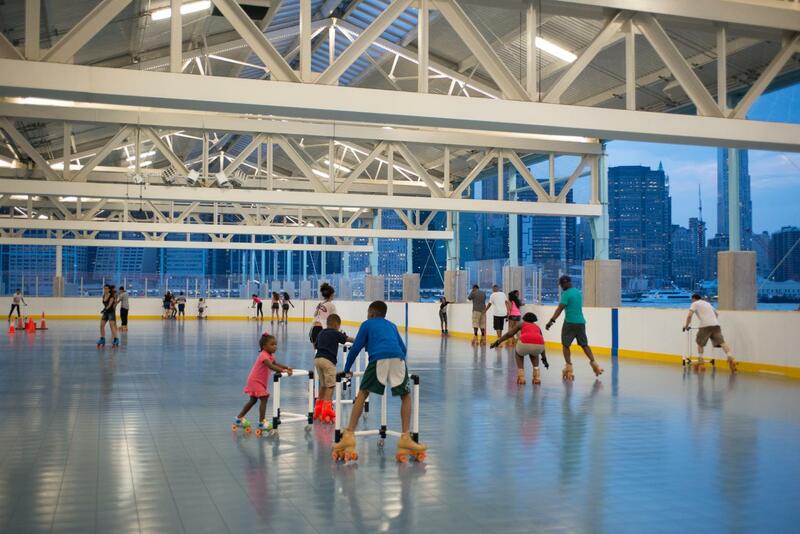 Officials at the 85-acre Brooklyn Bridge Park, which also features soccer fields and picnic areas, thought roller skating fit perfectly into the park’s mission—not to mention its facilities. And since Pier 2 opened in May, the roller rink has already started to attract visitors in advance of its official opening on Friday. On a recent sunny weekday, Robert Nicholas, 35 years old, watched his children Diamante Dillon, 7, Damani Brathwaite, 5, and Anaya Dillon, 9, slowly navigate the rink, amused and undeterred by their frequent falls. The 180-foot-long oval rink at Brooklyn Bridge Park is operated by Michael Feiger of New York Skating LLC, a former owner of Empire Roller Skating Center in Brooklyn, which was more than 60 years old when it closed in 2007. The rink will be open daily during the summer from 10 a.m. to 10 or 11 p.m. and will also have evening adult skating sessions accompanied by a DJ. But as people turned their attention to other fitness crazes and sports, roller rinks struggled to keep up, particularly with increases in property taxes on their large spaces. Roller Skating Association International, a trade organization that represents rinks and manufacturers since 1937, estimates there are about 1,200 roller rinks open in the U.S., down from a high of between 1,600 and 2,000 in the 1980s. But its executive director, Jim McMahon, said there is evidence of people lacing up their skates again, with their 800 roller rink members opening 14 new rinks last year, double the number in recent years. It has also helped that the sport has acquired a retro chic vibe as well, Mr. McMahon added, with roller skaters appearing in recent music videos by Cage The Elephant, Avicii and Beyoncé. The roller skating scene in New York City went through a bit of a slump when three rinks closed within a short period of each other in 2006 and 2007, followed by Dreamland Roller Rink in 2010. In recent years, it has also rebounded with more opportunities to skate in parks and with private clubs. More than 20,000 people have visited Prospect Park’s Samuel J. and Ethel LeFrak Center since it was converted from a 16,000-square-foot ice rink to a roller skating rink in April. The park is expecting more than 50,000 people to have visited by the time it returns to an ice skating rink in mid-October. Requests for members of Central Park Dance Skaters Association to choreograph and perform dance skate routines are on the increase lately, as are the number of spectators at the group’s dance circle, which has taken place in Central Park since 1978, said the organization’s President Bob Nichols. “The truth is that the culture around skating has continued to evolve along with the rest of the world,” he said. Skaters at Pier 2—at least those who aren’t looking at the floor trying not to fall—get a view of lower Manhattan, One World Trade Center and the Statue of Liberty as they glide around the rink. Please click here to read an online version of this story.